﻿ About | Colorco LTD - Custom Surface Design & Fabrication with Mosaic, Waterjet and More! Founded in 1986, Colorco Ltd. is a full service custom surface fabrication studio that works with architects, designers, artists and showrooms. Our artists and staff complete projects utilizing a wide variety of styles and techniques, including classic European mosaics, water jet cutting, whole tile image mosaics, custom etching and printing on tile. Projects have been installed in a wide variety of settings, including residences, hotels, restaurants and public spaces. All of our work is completed in Merrimack, NH. Jim Burnard with one of his early digital prints. The story of Colorco’s creation is unusual for a company that produces some of the nation’s most exceptional mosaic installations. 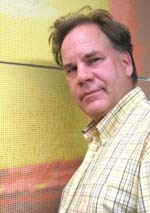 In the 1980s Colorco founder and president Jim Burnard was completing his electrical engineering master’s degree research at the University of Massachusetts Amherst while working for a major national defense contractor. Between graduate school and work, Jim was able to pursue a wide variety of endeavors, including pioneering projects that involved the compression of images through use of a fixed-color palette and elements of a fixed size. While doing his research, Jim faced the problem of scanning or taking a photograph of an image that was composed of thousands of colors and then compressing it to a limited fixed-color palette that could be understood by the computer. Today known as “pixilized imagery,” at the time it was a new process that had the potential for reducing computer image file size. This process required creating an actual color universe that the computer system could choose from when translating a scanned image into a digital rendering. After solving this process, Jim wondered if he could manipulate his system for use in American industry, particularly textiles and mosaics. The colored tiles offered by manufacturers could be mathematically incorporated into Jim’s color universe, allowing for the translation of any image into a pixilated copy using the tile colors as the image components. During his research, Jim visited a leading American mosaic manufacturer and observed that their designs were being rendered with graph paper and colored pencils. As an engineer, Jim felt that he could work to develop a more efficient system for creating large-scale complex mosaics. An efficient mosaic image manufacturing production method developed by Jim combined with his pixilization and color-rendering technology is still used today as a proprietary Colorco production method. Although Colorco started out exclusively in whole-tile imaging, architects and designers who met with Colorco staff would constantly ask about mosaic projects that went outside of the scope of whole-tile imagery. As an engineer, Jim sought to create fabrication solutions that could allow Colorco to produce mosaics using a wide variety of methods and meet the needs of the design community. Thus Colorco explored and expanded into classic European mosaics, water-jet technology, custom etching and printing on tile. With these methods at their disposal, Colorco employees are able to offer solutions to any architect’s or designer’s questions and needs.